All Catering Sinks are manufactured in 403 grade stainless steel and have 50mm rear upturns, all come with full stainless steel undershelf in 430 grade with adjustable feet. 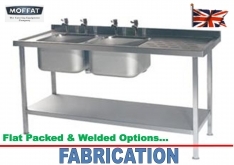 Sinks can be either be delivered Flat Packed or Welded. Gastronorm drawers are an option and can be lockable. Additional undershelves (or no undershelf) are possible on welded stock. Pillar, & Mixer Taps with Pre-Spray units ..